This evening I spoke in the incredible Baroness Trumpington’s debate about the future of Bletchley Park, a place she worked in the war. She is the oldest female peer and I am currently the youngest so it was irresistible to speak in her debate. I am not an expert on Bletchley but I wanted to talk about its influence. as a novice baroness and someone who has worked in technology my whole career, being invited to tea by baroness trumpington was a highlight of my first few weeks in your lordships house. and hearing her today i defy anyone not to be inspired. I am not in the detail of the complex situation that has developed at blethchley and that threatens its future but I would like to make three points to illustrate why it is such an important institution. Firstly, today is the 25th birthday of the world wide web. it was probably about this time of the day when Tim Berners lee started to write the paper that he submitted to his boss describing his invention – his boss was nonplussed and famously wrote “vague but interesting” before he handed it back. Like the millions of lives that were saved due to the direct work at bletchley the web has transformed millions of lives and both are achievements of which this country should be immensely proud and grateful. I believe both blethchley and the invention of the web should be used more often as examples of british creativity and possibility. I am not convinced many people in our country are aware of the history of either one. Yesterday I had the wonderful opportunity to spend time in the science museum with the computer on which Tim wrote the first code for the web – it has come on loan from cern. were in a room full of computational history – charles babbages analytical engine, the first lyons tea factory ‘leo’ computer and ERNIE – the random number generator that ran the premium bonds. What struck me was how many women were part of the stories of all these machines. 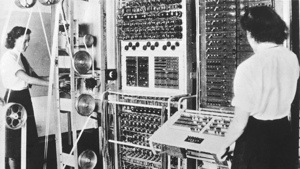 From ada lovelace to the women working on ERNIE and at lyons. starting with blethchley and on through the 50s and 60s and 70s women worked in computing and fuelled this burgeoning industry. half the people working at blethchley were women including a significant number of female coders. now we are we facing stagnation in the numbers of women working in the tech sector. can bletchley be more widely used to try and reverse this trend? The numbers are depressing – and they start young. Women are not choosing maths a level or other stem subjects, are not becoming techical architects, coders or even digital entrepreneurs. Ladygeek estimates that if current trends continue just 1% of tech sector could be female by 2040. Finally I would like to mention coding itself. From sept this year every child from primary school age will have to learn to code. This is a visionary and exciting policy and the government is to be congratulated. We will lead the g8. There are a number of organisations that have been encouraging coding for many years, especially amongst children – from young rewired state, to codeclub to freeformers to decoded to techmums and all should be applauded. The currivulum shift has raised the profile of coding with initiatives such as year of code and hour of code demonstrating its power. And yet there are still a number of challenges – Resources to train teachers are limited. It would be sad if this incredible opportunity was not given the best chance of success. I look at bletchley and think what an immense shame if it did not continue to be a national treasure. what a tribute to the brave people that worked there in secret for so long if we celebrate the UK’s technology roots, fight for more gender equality and create new generations of coders. I’m so glad, as a member of the BCS CCS group, that you take an interest in the origins of computing in this country as well as helping to move today’s generation on in the computing field.